View conference notes including presentations and presenter bios. The Second Convening of Ohio County Land Banks, co-hosted by Thriving Communities Institute and Cuyahoga County Land Reutilization Corporation, will offer essential information for land bank board members and staff, county and municipal officials, community and economic development officers, community development corporations and anyone interested in repurposing vacant and abandoned properties and revitalizing our neighborhoods. The conference will offer over 25 breakout sessions covering topics of concerns to land banks throughout Ohio. In addition, 2 mobile workshops will be offered Tuesday afternoon allowing participants to witness projects first hand. For course descriptions, click here. Presenters will include legal and financial experts, land bank practitioners with hands on experience and community organizations that work to move projects from concept to reality. For information about being an exhibitor or sponsor, click here. 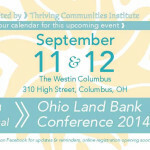 12:45 – 1:30 Panel – Land Banks: Where Do We Go From Here?